It’s officially springtime, and with Easter passing I’m beginning to go through my lighter dishes to go with the change of seasons. I get giddy thinking about fresh grilled corn on the cob, summer salads full of fresh veggies, pears, apples and toasted nuts, and most of all the selection of fresh fish in the local market. One of my all time favorites is salmon, however, one badly cooked salmon can turn me off for months, so I have to choose wisely when I dine out. The dry, chalky taste of overcooked salmon is one of the most devastating things you can be met with at the dinner table. 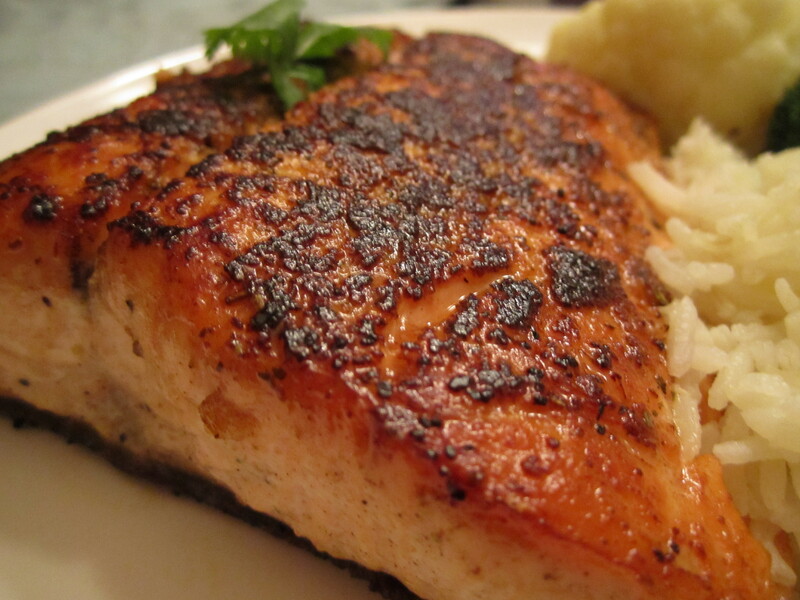 Similar to a burnt cookie, overcooked pasta, or a hockey puck steak, overcooked salmon is a major offense in my book. But when it’s done well, you’ll want to have it every day of the week. The beauty of salmon is that it can pick up a variety of flavors, teriyaki, garlic, white wine and butter, and its meaty texture lends itself to a variety of cooking methods. I don’t recommend cooking Dover sole on the BBQ, but a salmon can stand up to this summer time classic. The delicate crispy, golden crust that forms on the outside is a perfect contrast to the juicy, meaty flesh. It’s a symbol of summer and health, and gets you on the track to looking stunning in your new summer swimsuit. Perfect pan-seared salmon demands on a very hot pan. Use a heavy cast-iron skillet, which heats evenly. Warm the pan before you add the oil – either extra light virgin olive oil or vegetable oil; this trick allows the pan to get it really hot without burning the oil. A preheated pan also requires less oil. Once you master this method you’ll be able to whip up a gourmet dinner in less than 10 minutes – golden brown outside and tender inside. I like to serve salmon with a fresh mixed green salad with a tangy vinaigrette, a refreshing contrast to the rich, yet delicate fish. In a small bowl, mix garlic powder, rosemary, thyme, seal, pepper, lemon pepper, and ginger. Brush the salmon with olive oil on all sides. Take the spice mixture and generously coat both sides of the salmon. Set a large cast-iron skillet over high heat. When a drop of water skitters on the surface, add the oil. Tilt the pan to coat the bottom evenly and heat until the oil is almost smoking, about 30 seconds. Place the salmon skin side up in the cast iron skillet. Cook until golden brown on the bottom, about 4 minutes. Turn the salmon and cook an additional 3 to 4 minutes on the other side. Then lower heat to medium, place lid over skillet to trap heat and finish cooking an additional 2-3 minutes. With a minute to go, add a tbsp. of butter and let is melt in the pan, spoon it over the top of the salmon right before you turn off the heat. To check if the salmon in ready, stick a thin knife in the thickest part and gently look at the color inside. It should be juicy and barely turning opaque. If you over cook the fish it will be extremely dry and very white in color. 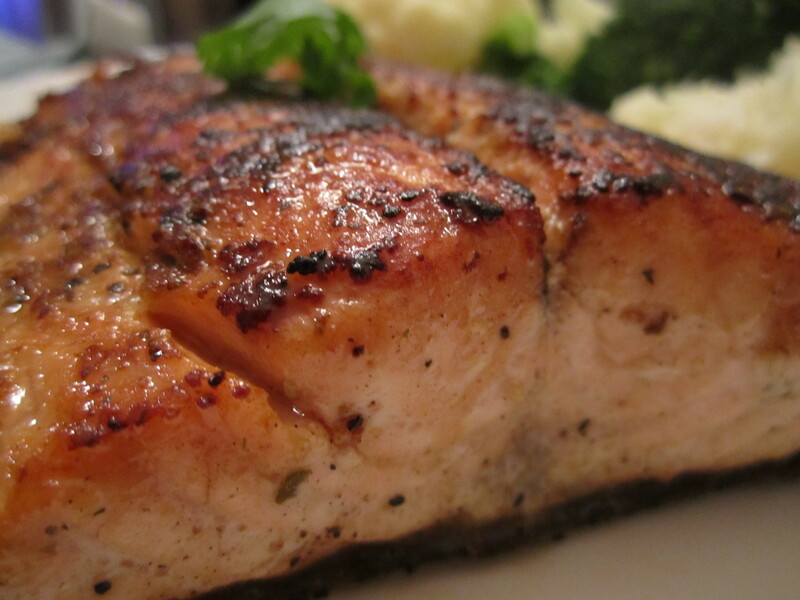 When salmon is cooked enough to eat safely it will lose its translucency and become opaque. It should also flake easily when tested with a fork. Serve with a fresh salad and enjoy your very healthy yet tasty dinner! 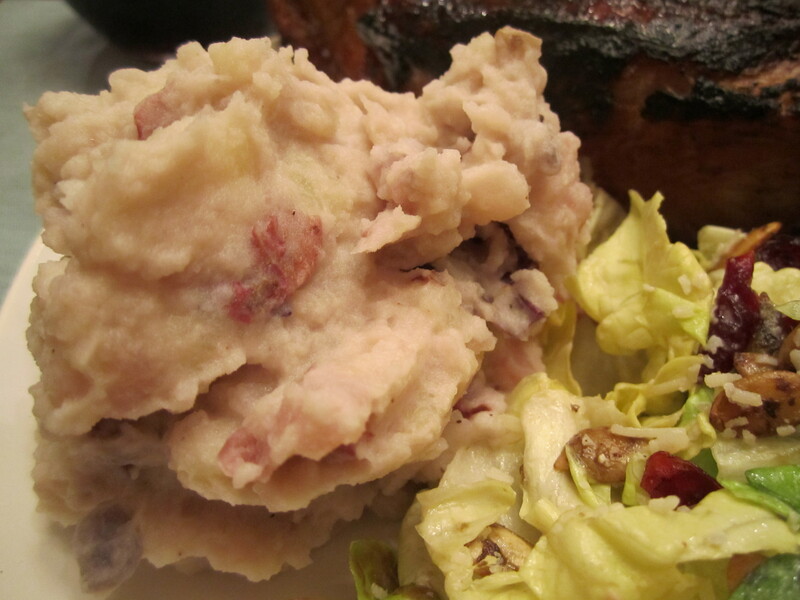 Want a new spin on your traditional steak and potatoes? Try adding a little wasabi! The buttery potatoes have a slow-rising, distinctive heat, which contrasts well with the juicy steak. In the summertime, there’s nothing quite like as satisfying as the smell of a big juice steak grilling over a hot fire. One of my favorite things in the perfectly charred crust, all the seasoning from the grill in one perfect bite. 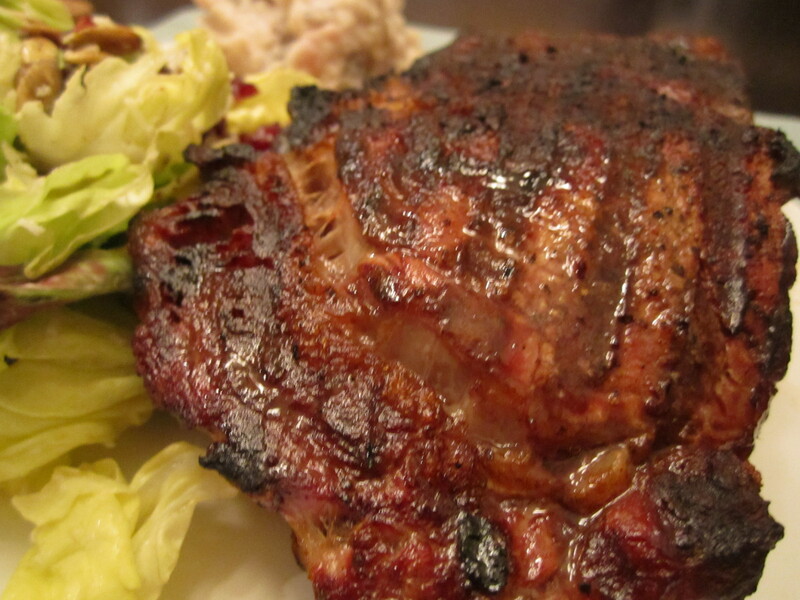 The grill may just be the best thing that ever happened to a steak. To make my life a little easier, I bought mixed baby potatoes so I could avoid both peeling and chopping. I also like the look of the potatoes skins mashed in, it makes it feel more rustic and the skins contain many essential nutrients, so why throw that away? On a side note, I had a bad experience with my disposal and potato skins, so I try to avoid peeling at all costs… you can probably guess how that turned out. The small potatoes have a rich buttery texture so you have to add less milk and butter to get them to the right consistency. Open up a nice bottle of red wine, relax, and enjoy your $40 steak house dinner in the comfort of your own home for a quarter of the price. 2 rib-eyes, about 2 inches thick, ours we’re BIG steaks, so if you get smaller ones you’ll need to shorten the cooking time. Here’s a helpful link on grilling steaks. Remove steaks from fridge 30 minutes before cooking and season well with salt and pepper. Rub the spices in so they don’t fall off on the grill. Then put them aside and let them warm up to room temperature. Once the water is boiling, add a generous portion of salt (at least a tablespoon) and add the potatoes. Leave potatoes on a light boil with the lid off for 15-20 minutes. Check by sticking them with a knife, it is goes in without pressure they’re done. If you use a meat thermometer (which you should feel no shame in using, especially if you are new to cooking meat) 130F in the middle is medium-rare, 140 is medium. It’s only about 1-2 minutes difference on the grill! Pull the meat off and let is rest for 5-10 minutes before serving, this allows the meat juices to redistribute. If you cut into it immediately all the juice will run out and you’ll be left with dry steak. While the meat rests, it’s mashing time! Add cream, butter, salt and pepper (to taste) and mash. Please please please, buy yourself a 4 dollar masher. Please do not use an electric mixer, this beaks up the gluten in the potatoes and leaves you with tacky, sticky textured potatoes. Slowly add the milk, add about ¼ – ½ a cup, more or less depending on the texture you’re looking for. I don’t mash my potatoes until they are completely creamy, I like a little texture, so a few lumps are ok with me… plus the skin helps give it a rustic feel. Add the wasabi at the end and mix with a spoon, add it slowly and taste as you go along to get the appropriate heat level for you and your guests. I didn’t want to use the powdered wasabi I found in the grocery store (maybe one of you have tried it, and if so please let me know how it is), so I stopped by my local Japanese restaurant and asked them for a small side of wasabi. Once you’re finished mashing, your meat has rested and you are ready to dig in.